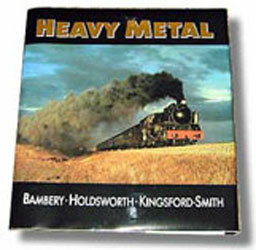 TAKE THREE PHOTOGRAPHERS, with a combined 75 years of experience focusing their lenses on the rail scene, give them free rein to select their best shots from visits to the outstanding steam railroads the working over, provide a generous 10-1/2” x 11-1/2’ page format on heavy glossy paper, and you have HEAVY METAL. The authors George Bambery, Malcolm Holdsworth, and Robert Kingsford-Smith were striking their campfires to capture the golden glint and silhouette scenes of steam at sunrise. As the dust jacket declares, “The emphasis of the book is on the use of light and color, particularly the saturated tones which predominate at sunrise and sunset.” Dynamic action shots from Australia Brazil, Chile, East Germany and Germany, Hungary, India, Indonesia, Italy, Japan, Kenya, Poland, Portugal, Spain, Switzerland, and Syria are also featured. Here’s the perfect book for that perch on the night table, to page through time after time.